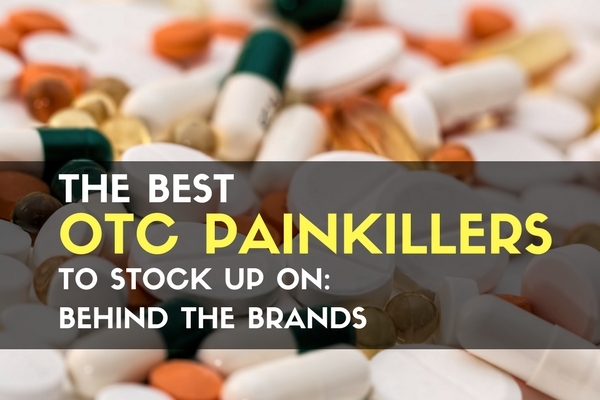 Many over the counter painkillers are the same ingredients under different brand names. Others are cocktails of ingredients in slightly different amounts. We’re going to take a few moments to dissect the different brand names and show the basic building blocks of pain medication. Using this, you can update your first aid kid so you have variety instead of redundancy. Before we go any further, we want to reiterate that none of us are doctors, and we are simply sharing common information found on labels. We do not advocate self medicating or experimenting with medications without consulting your doctor. This information is to be taken at face value only and does not provide medical advice or endorsements. Now that all that is out of the way, let’s get to dissecting what is actually in all of these different brand name drugs.. Most big brand names simple take one ingredient, pack it up in a pill or capsule, and then justify some markup with a little marketing. Here are what the most common pain relievers contain. All of these are available in generic label versions, just called by the actual ingredient. Acetaminophen overdose is the number one reason for calls to poison control centers. Just 25% more than the daily dose can cause liver damage if taken over a prolonged period. Only four times the daily dose limit can be lethal. Knowing the strengths and dangers of even over the counter medications is important. A few brands bundle up a few ingredients and make a mixture as a product. The mixtures are sometimes more effective, but can also be limiting for those sensitive to any of the ingredients. Even those that are not sensitive may have certain ingredients not be as effective as others. This limits the number of people that can use these pre-mixed “cocktail” drugs. One ingredient you may have noticed each one adds is caffeine. It works great for these brands, so why not add some caffeine as a stand alone supplement to your first aid kit? The uses for caffeine are numerous, and we go into a little more detail on this later. To Use Name Brands or Not to Use Name Brands? That is the question. Name brand painkillers are not more or less effective than generic. The specifically regulated ingredients and amounts make it so there is no variation between them. The delivery methods may vary though, since name brands may come with a ‘quick dissolve’ capsule or other features generics may not have. Either way, we don’t find brand name painkillers to be worth the extra money, especially when considering single ingredient painkillers. Aspirin – Low strength for minor aches and pains. It is an NSAID (Nonsteroidal anti-inflammatory drug) and is commonly used to combat heart attacks and conditions. Ibuprofen – Scaleable strength based on dose size, it is often prescribed for cramps, migraines, and arthritis. Scaling the dose all the way up to 800mg makes it prescription strength, but more dangerous for livers and kidneys. It too is an NSAID. Certain NSAIDs are more effective for various people, so having multiple is not a bad idea. Acetaminophen – Used for treating mild and moderate pain, it can treat both pain and fever. It is commonly used in cold and flu remedies. Naproxen Sodium – Naproxen is and NSAID and in the same class as ibuprofen, but is regarded as one of the better inflammation fighters. The downside is stomach ulcer risk, which requires naproxen sodium to usually be accompanied with proton-pump inhibitors. Caffeine – Caffeine is a hell of a drug that does more than wake you up. It is actually classified as a stimulant psychoactive drug. We all know it prevents drowsiness and improves cognitive performance. Pain can slow you down and cloud your thoughts, and a little caffeine can be just the thing to keep you going. At TruePrepper, we believe this is one of the most overlooked drugs you can stockpile (along with anti-diarrhea medicine). This simple list should let you recreate any OTC brand with accuracy and versatility. Having the ingredients separate for the cocktail type medicines can be especially useful if you or the people you treat are sensitive to any of these. Having caffeine pills separate can be great if you need a boost to stay awake, or need to mix with acetaminophen or aspirin to recreate a ‘cocktail’ painkiller. Being crippled from pain is not something that will help you out in a disaster or when SHTF. Having the right OTC painkillers stocked up in your first aid kit will be your first defense when you encounter this situation. Take the time to make sure you have a good mix and all of the essentials. Keep exploring, stay prepared, and be safe.